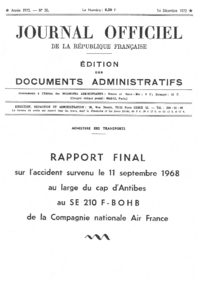 A Sud Aviation SE-210 Caravelle III passenger plane, registered F-BOHB and named "Bearn", was destroyed in an accident 41 km south off Nice, France. All 89 passengers and six crew members were killed. Air France flight AF1611 departed Ajaccio, Corsica at 10:09 on a regular flight to Nice-Côte d'Azur Airport (NCE). The Caravelle was overhead the Mediterranean Sea at 10:30 when the crew reported unspecified problems and requested a direct approach to Nice. This was approved. At 10:31 the flight contacted Nice Approach and reported a fire on board, repeating their request for an emergency landing at Nice. Nice Approach cleared the flight to descend to 2000 feet without restrictions. Last radio contact was at 10:32 when the crew radioed: "On va crasher si ça continue." ("We will crash if this continues"). At 10:34 the airplane struck the surface of the sea. It appeared that the fire had originated in the rear of the cabin in the right lavatory and galley area. It has been suggested in several tv shows that the airplane was struck by an unarmed missile, fired during French military practice. PROBABLE CAUSE: "La commission a conclu que la perte de F-BOHB avait pour cause un incendie dans la cabine, incendie don’t elle n'a pu déterminer l'origine." Distance from Ajaccio-Campo Dell'Oro Airport to Nice-Côte d'Azur Airport as the crow flies is 231 km (144 miles).